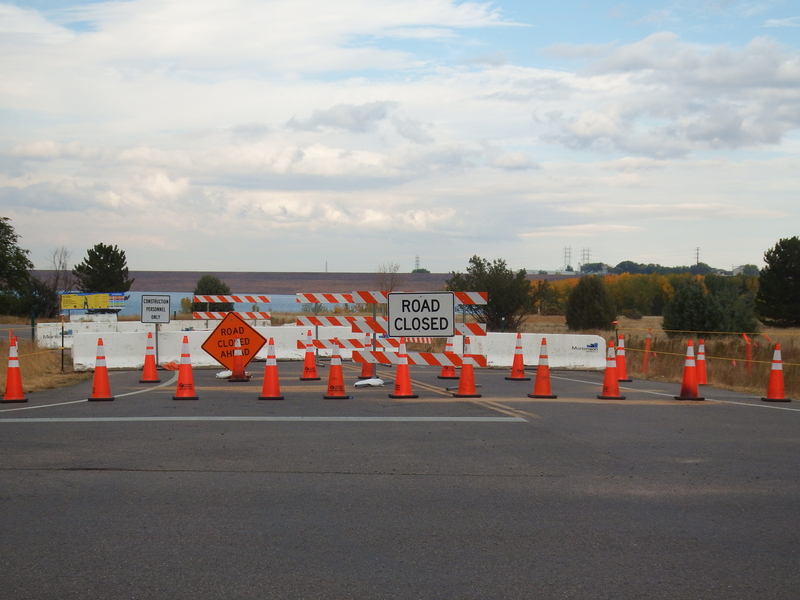 Much of Chatfield State Park continues to be closed closed for construction associated with the Chatfield Reallocation Project. The swim beach, which had been scheduled to re-open on Memorial Day 2018, will be closed for the summer. The following photos were taken in April 2018. A map showing closed areas is available at https://chatfieldreallocation.org/construction/. 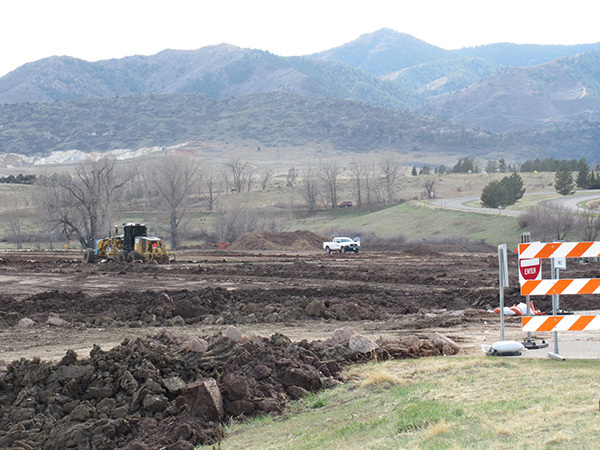 Much of Chatfield State Park is now closed for construction associated with the Chatfield Reallocation Project. The following photos were taken during December 2017 and January 2018. 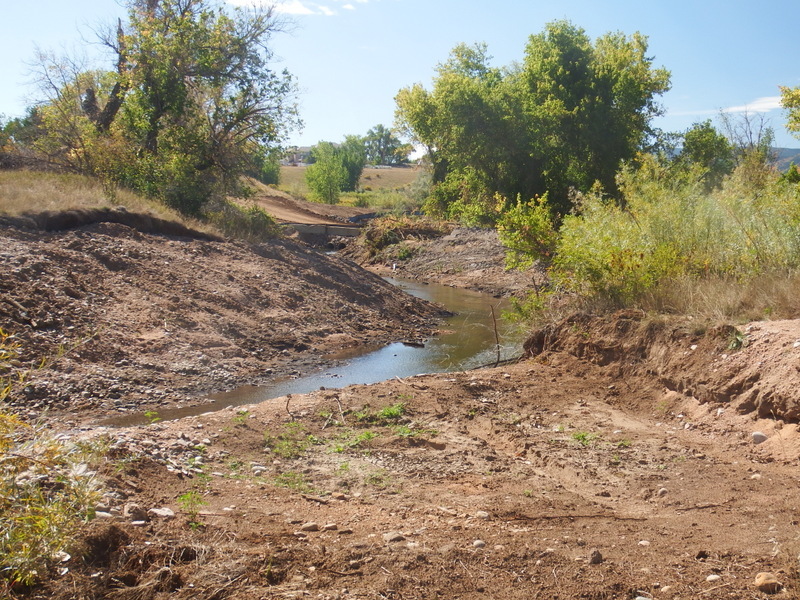 At Plum Creek efforts are being made to stop stream downcutting. It’s not clear what is being done at Deer Creek. 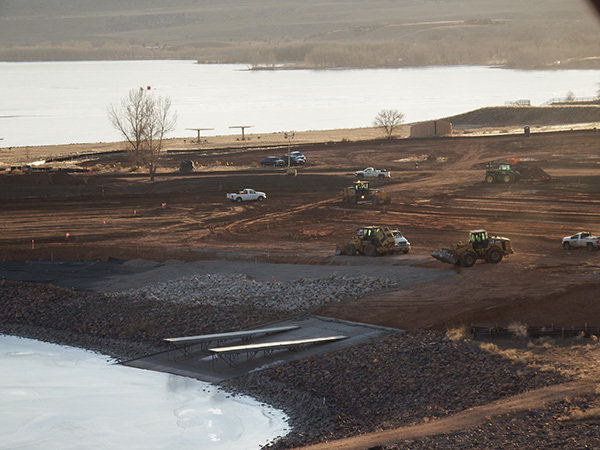 The North Boat Ramp is also being redeveloped. 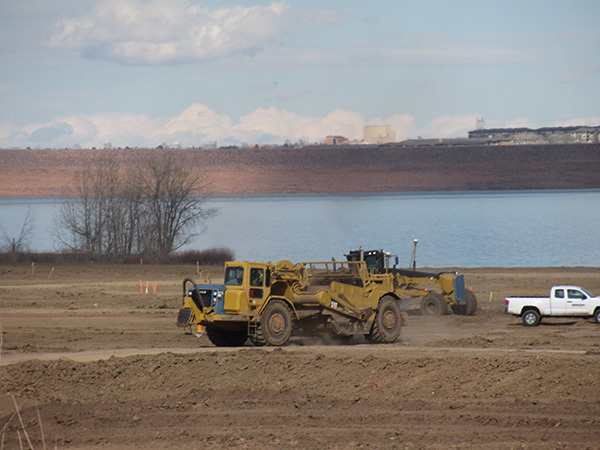 Planning for Chatfield Reallocation is ongoing, even though the Audubon Society of Greater Denver (ASGD) has taken the US Army Corps of Engineers to court. 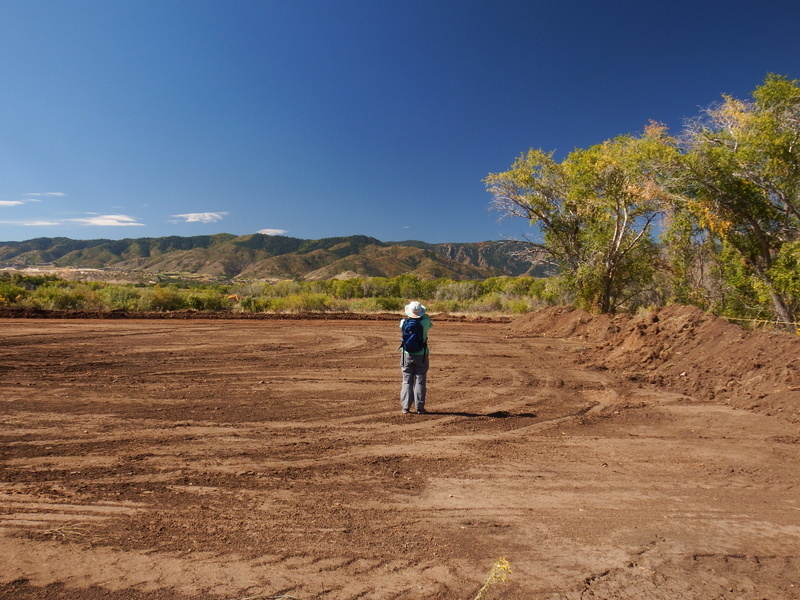 In late August, contractors came in and pumped 18 inches of water out of Blackbird (also called Discovery) Pond in the southwest corner of Chatfield State Park. 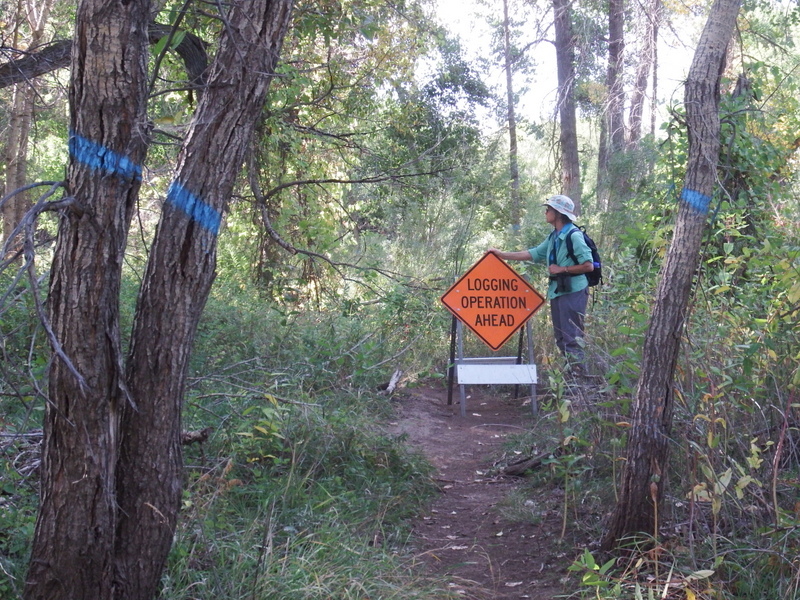 ASGD uses the pond under a State special use permit for its environmental education programs. 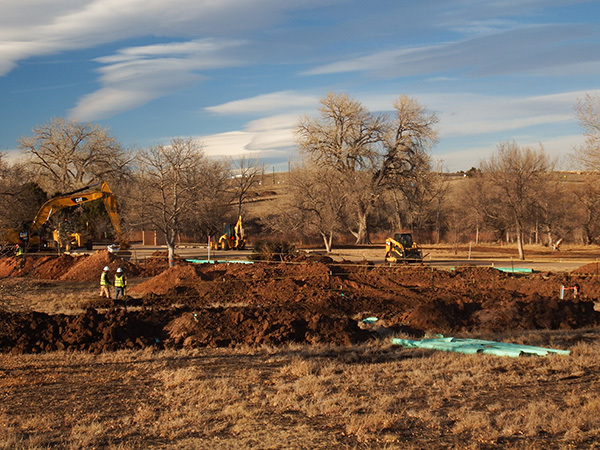 Water was also pumped out of “Turtle Pond”, a former stock pond near Plum Creek well known to birdwatchers. 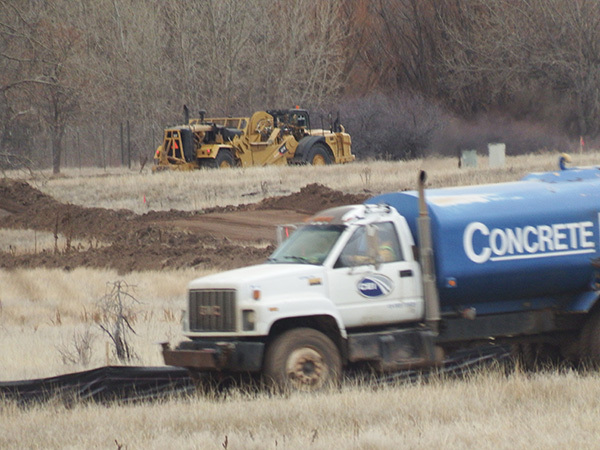 Inquiries to the Corps of Engineers, the Colorado Water Conservation Board and the Chatfield State Park staff revealed that the pumping was a “test” to see if water from those ponds could be used to replace wetlands that will be destroyed by the Reallocation. Because the water levels in the ponds have been slow to recover, the tentative answer is NO, although that could change. 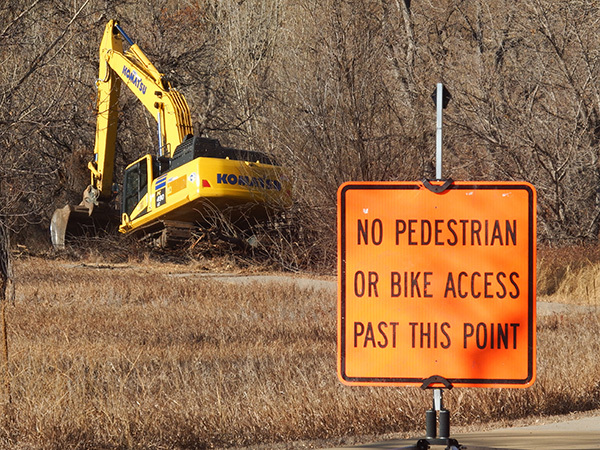 ALERT: Please be on the lookout for any activity such as pumping water, earth-moving, tree-cutting, road-building, and other destruction/construction in Chatfield State Park. If you see such activities, please contact us and report them to the ASGD office at 303-973-9530 immediately. 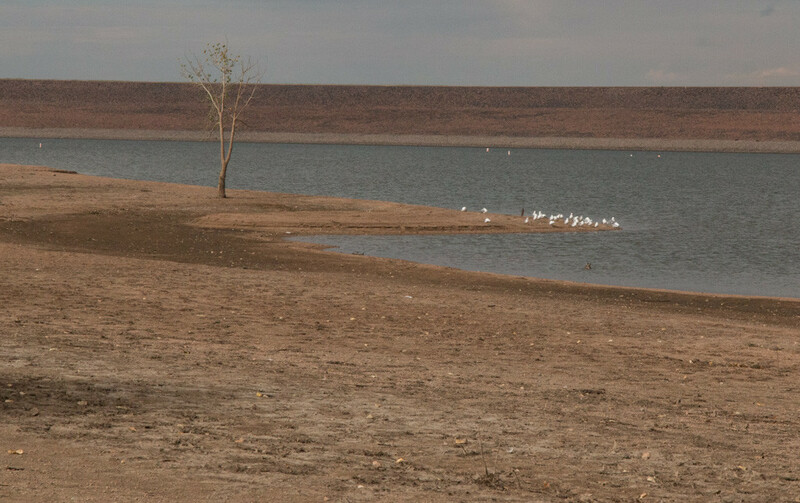 In 2015 an unusually wet spring coupled with rapid snowmelt forced Chatfield Reservoir to be used for its primary purpose — flood control. 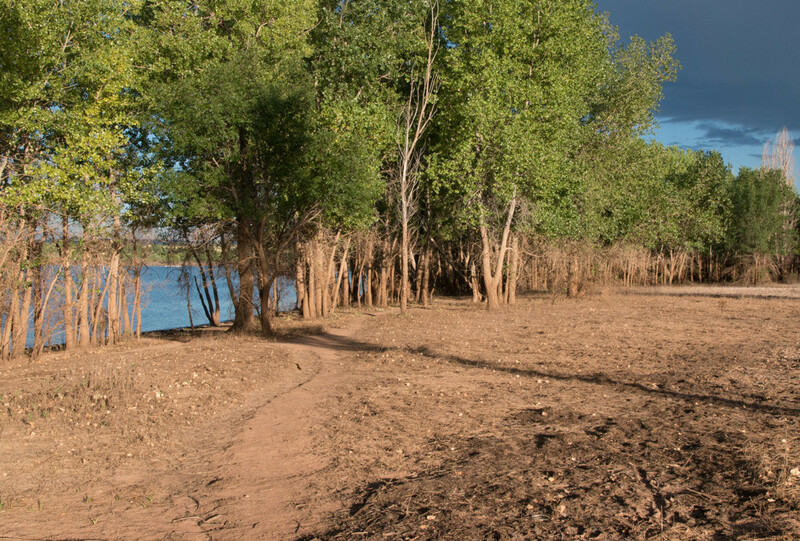 By August 3 when the following photos were taken, high water levels had returned to normal. Changes resulting from the flooding offer some indication of the effects reallocation would have in the 7 years out of 10 when no additional water would be available to store in the reservoir. One obvious effect of the flooding is that it killed lower branches on trees that were partially submerged. 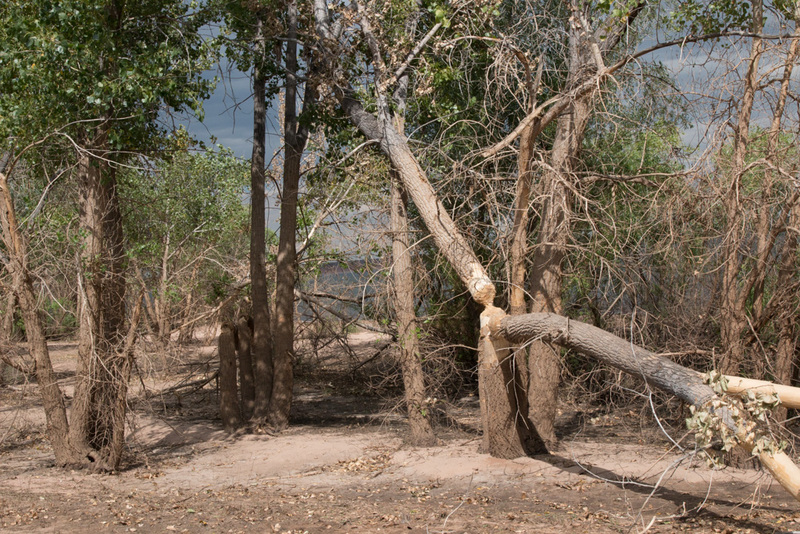 If high water levels were maintained in the reservoir for the longer times anticipated by the reallocation plan, these trees would likely die completely. 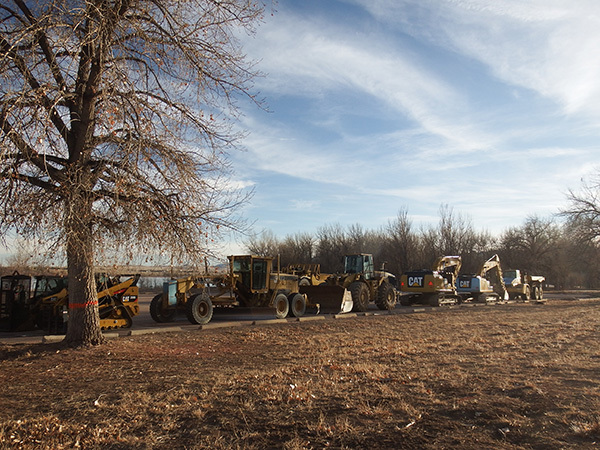 Approximately 296 acres of trees deemed most likely to die would be cut down and removed as part of the reallocation project. The Chatfield shoreline viewed from the a spot near the North Boat Ramp. The reallocation project would remove these trees and many others close to the shore. Massey Draw Picnic Area. Reallocation would likely eliminate all the trees in this photo as well. Trees near Eagle Cove. 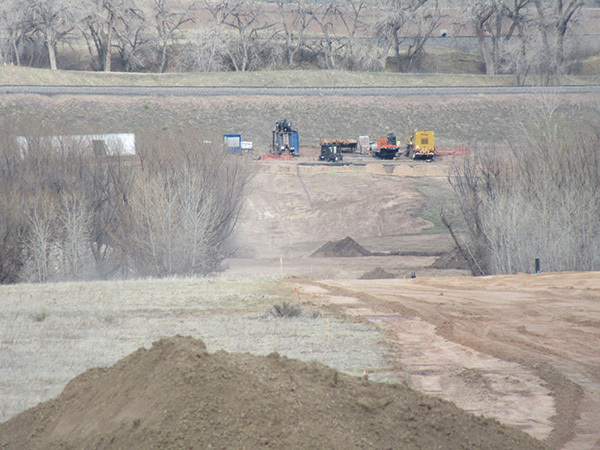 Reallocation would significantly impact wildlife in Chatfield State Park. Notice that beavers apparently cut down two of these trees while they were partially submerged. 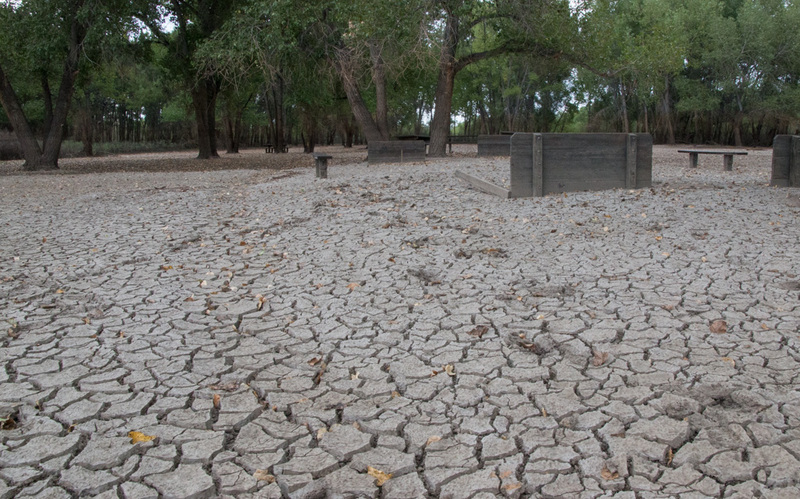 Remaining puddle and mud at Deer Creek Picnic Area. The shore near Fox Run. Imagine what this pleasant path along the shore would be like without trees. Gulls on the peninsula east of the South Boat Ramp. Horseshoe pits at the Plum Creek Picnic Area. Reallocation plans call for this area to be submerged during wet periods that occur in about 3 years out of 10. The rest of the time it would look much like this — but likely without the trees. 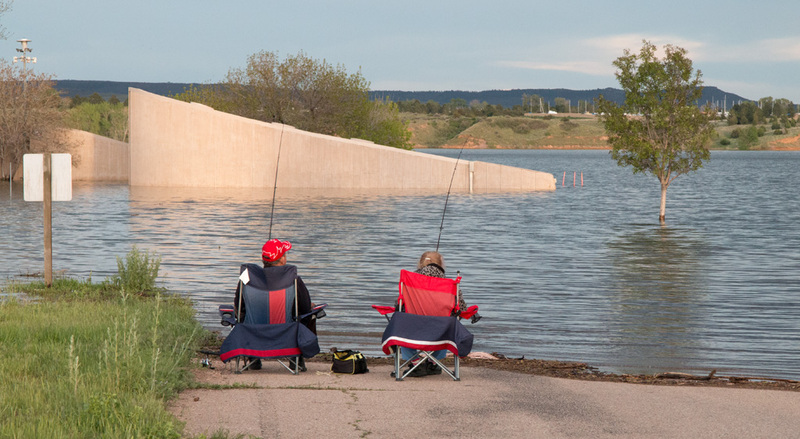 In an earlier post we shared some May 2015 photos of high water in Chatfileld Reservoir. 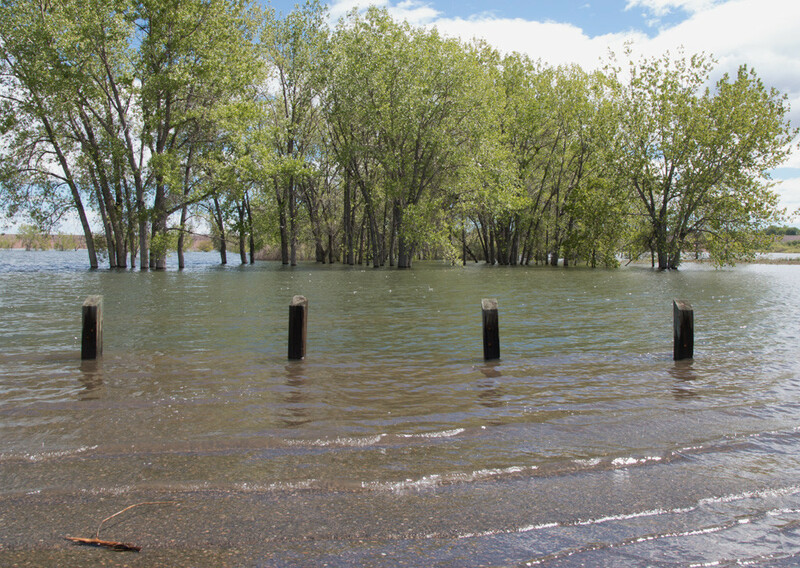 In June 2015 the Chatfield water level broke the record of 5447.6 feet set on May 25, 1980. At 8 am on June 18, 2015, it was 5448.4 feet and slowly continuing to rise. 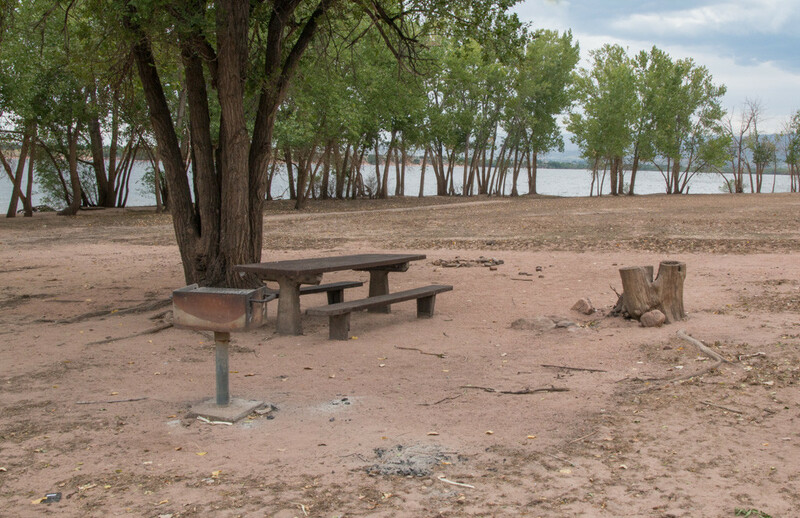 The west side of Chatfield State Park, including the main entrance off Wadsworth Boulevard, was closed. 5448.4 feet is 16.4 ft. above the current storage level of 5432 feet and 4.4 feet above the 5444 foot storage level proposed by reallocation plans. Several links to news coverage of the flooding are listed below. Imagine what this would be like if these flood waters were added on top of a reservoir that was already filled to 5444 feet. 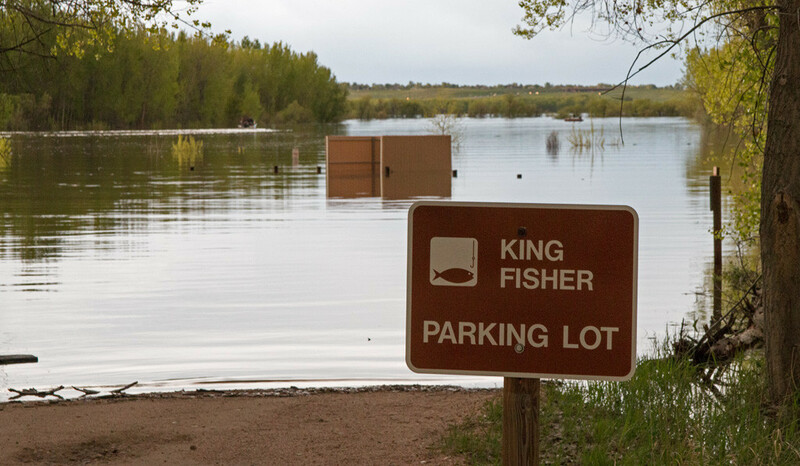 Unusually high precipitation combined with spring snow melt caused the water level in Chatfield Reservoir to reach a height of 5440 feet above sea level in May 2015. This is 4 feet lower than the maximum storage elevation of 5444 feet proposed by the Chatfield Reallocation Project. However, the following photos give some sense of parkland that reallocation would destroy. If reallocation is allowed, water levels in Chatfield Reservoir would fluctuate over a much larger range than they do currently. In wet years, which are expected to occur in 2 or 3 for years out of 10, non-flood water levels would reach 4 vertical feet above the levels shown in the photos. Because shorelines are sloped, 4 vertical feet translates into much more than 4 horizontal feet. Temporary flood-prevention levels would be even higher. 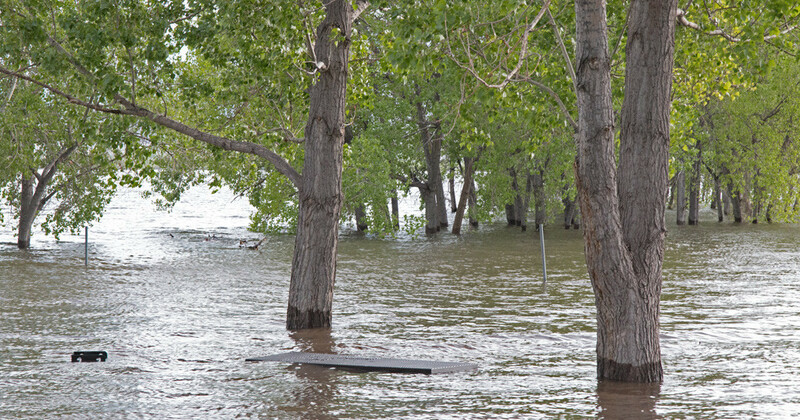 Trees can survive the kind of short term submersion anticipated for the 2015 flooding. Long term submersion like that proposed by Chatfield Reallocation would kill them. 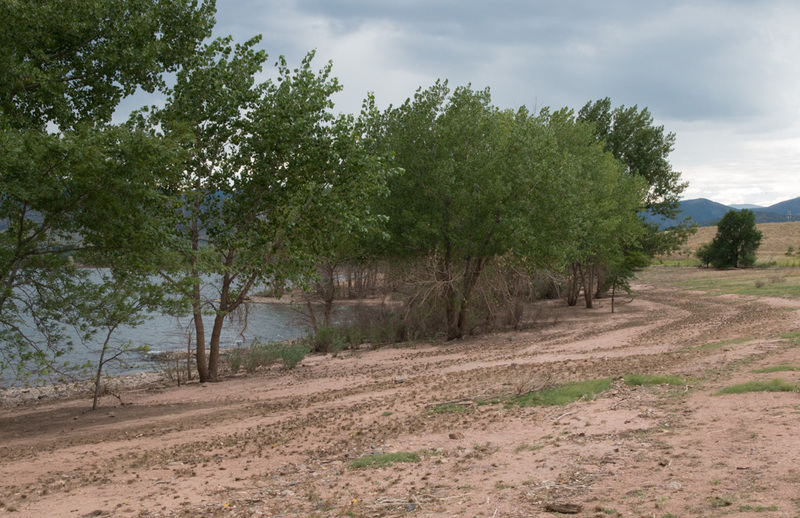 In dryer years, water levels in Chatfield Reservoir would be near current normal water levels. However, the park would be changed dramatically. Partially submerged trees in these photos would be removed. Facilities would be moved to higher ground. In some cases, higher ground for these facilities would have to be created. When water levels are low, as they are expected to be much of the time, the relocated facilities would be a long way from the shore. The distance between the bathhouse and the shore at the swim beach would be a particular problem for swimmers with small bladders, but the long distance to the shore would likely affect others as well. For example, long distances to the shore would make handicapped fishing and hand launching small boats more difficult. Click photos to display a larger version. Use your browser’s back button to return to this page. Road to the swim beach parking lot on May 14, 2015. The reallocation project would require major changes in this area. Ground would have to be built up for facilities like the bath house shown in this photo. A long walk to the beach would be required when water levels are low. Plum Creek area viewed from the south on May 17,2015. The restroom facility on the left side of the photo is at the southeast corner of the Plum Creek Picnic Area. During the winter a small herd of elk takes cover in these trees during the day. Long term submersion would kill the trees and leave the elk without shelter. They would have to be removed to keep debris from interfering with boating when water levels are high. 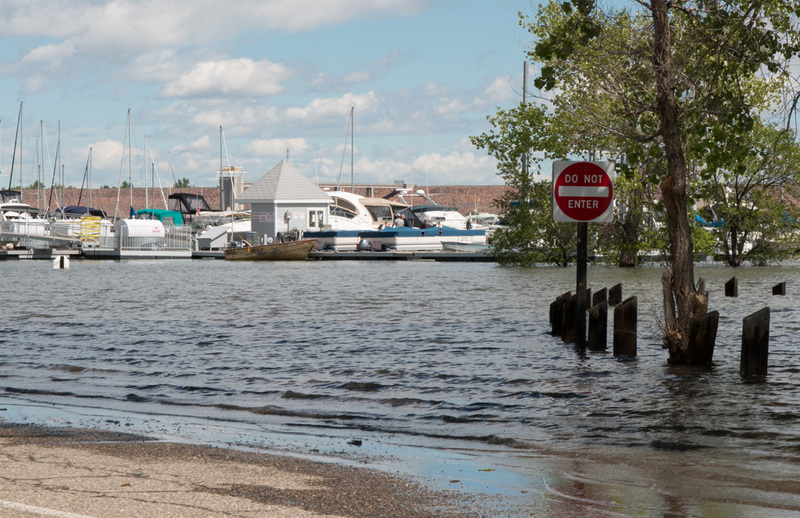 Spit on the east side of the marina from the east marina parking lot on May 17, 2015. These trees would also be removed. Marina dock viewed from the east parking lot on May 17, 2015. If space in the reservoir is reallocated, major changes in the marina would be required to accommodate large fluctuations in water levels. Path to the handicapped fishing pier west of the marina on May 17, 2015. Trees is this area would also be removed. Kingfisher Parking Lot on May 14, 2015. 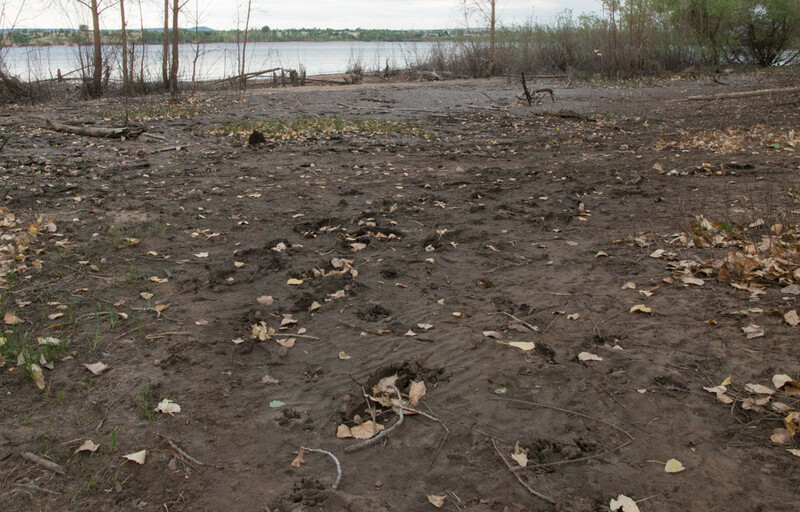 This photo shows more forested shoreline that would be obliterated to accommodate reallocation. 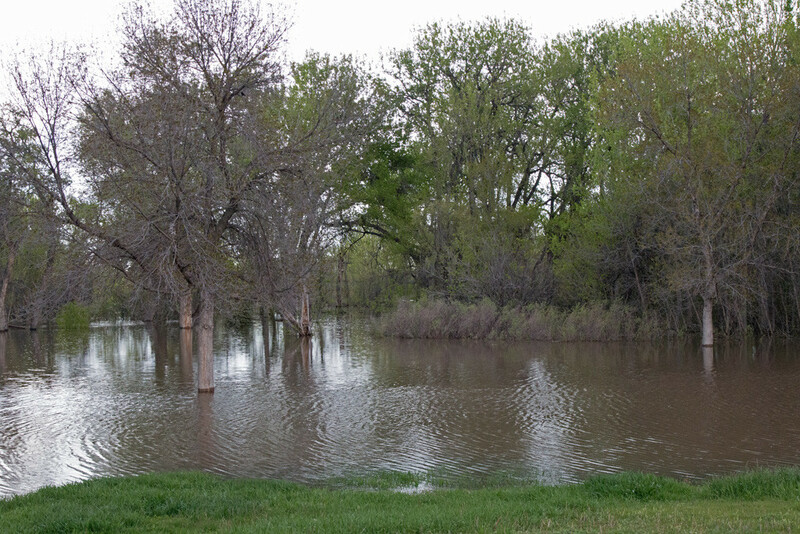 Jamison Picnic Area on May 14, 2015. Trees in this area would also be removed. In dry years water levels would be about where they are typically now — roughly 8 vertical feet lower than the levels shown in these photos. Imagine what the area would look like without trees. Picnic area near the balloon launching site on May 14, 2015. 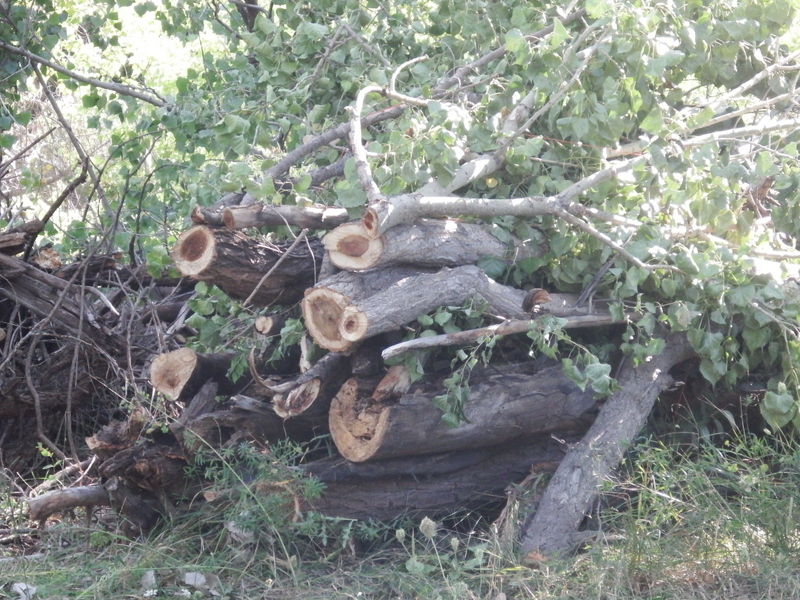 Trees that would be removed in this area include a snag with a hollow top where great-horned owls recently nested and raised four babies. 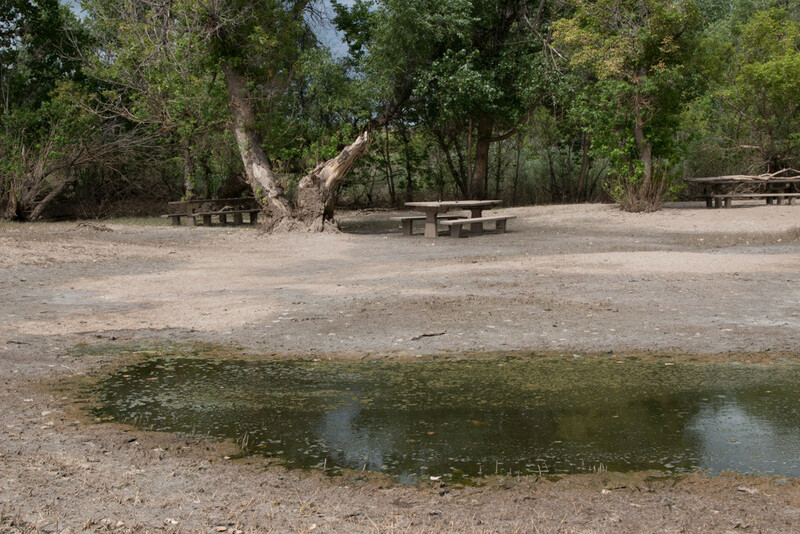 Massey Draw Picnic Area on May 14, 2015. Note the grill and picnic table in the foreground. 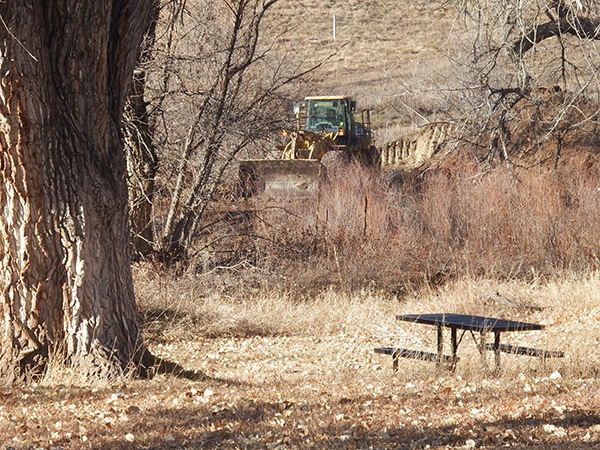 Plans call for moving this picnic area to higher ground that is currently treeless. 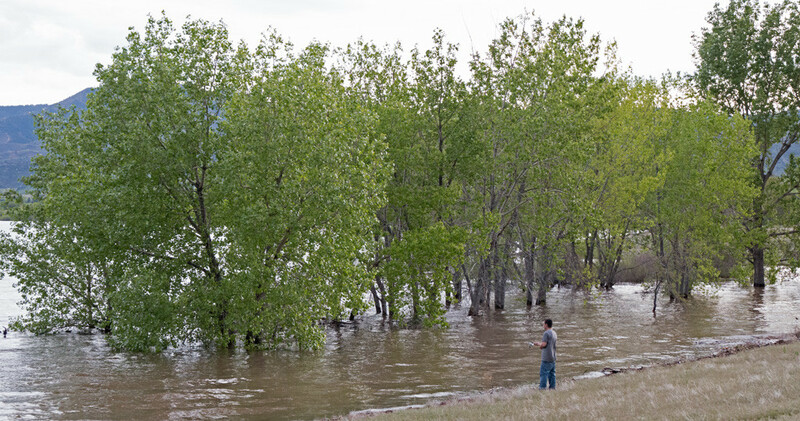 A fisherman near the North Boat Ramp on May 14, 2015. This area would have to be build up to allow boats to be launched when water levels are high. These trees would be removed. Please see links for hours and maps. Please contact us if these locations are inconvenient for you. We may be able to arrange to get you a bumper sticker some other way. 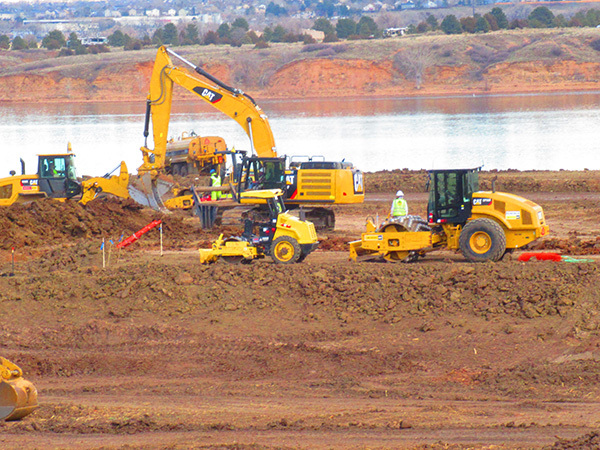 In a presentation given in June 2009, the Army Corps of Engineers noted the Chatfield Reallocation Project’s low reliability and high mitigation costs. At Chatfield, dependable yield from “natural” sources was 0. One would think that these fundamental observations might prompt the Corps to conclude that Chatfield Reallocation is not a worthwhile project to pursue. Instead the Corps decided to issue a policy waiver to reduce the price it charges for storage. This change obviously makes the project appear more favorable than it really is. A PDF version of slides used in the June 2009 is no longer available at its original address on the Corps website (http://www.corpsresults.us/docs/CleanWaterSupplyWorkshop/Cone%20Chatfield-Storage-cost.pdf). However, a copy is available here. Common measurements of dependable yield include: 50-year low flow; 2% chance; 98% reliability; 7-day-10-year low flow. At Chatfield, all of these measures of dependable yield are 0.